An Arabic letter handwritten by Father Khouri Youssef Samaan on August 14, 1911. It confirms the baptism of Oganine daughter of Saleem Lahoud on December 27, 1995. An Arabic letter handwritten by Father Khouri Bronobabas Elia al Antaki on March 5, 1911. It confirms the birthdate of Karima daughter of Michael Saliba on July 24, 1896, and baptism on August 15. An Arabic letter handwritten by Father Khouri Elias alHadshity on June 25, 1911. It confirms the baptism of (first name not clear) son of Ghalib Nema Hatem on May 23, 1895. An Arabic letter handwritten by Father Khouri Basilius Hayek on July 16, 1911. It confirms the birthdate of Sulaiman Fahous on April 5, 1897. Written in the bottom in English are notations that read: "Wadan Nassar or Henry Norris July 1897"
A handwritten letter, in both English and Arabic, written by Priest M. Koury, certifying that Tanous Habeeb Abi Hamad was born on November 12, 1895 and baptized on December 17, 1895. A handwritten letter in Arabic, written by Father Khouri Rafael on March 10, 1911. It confirms the birthdate of Nematallah and Kathrine (Twins) on November 2, 1894. A penciled note reads "Nantala Makray." 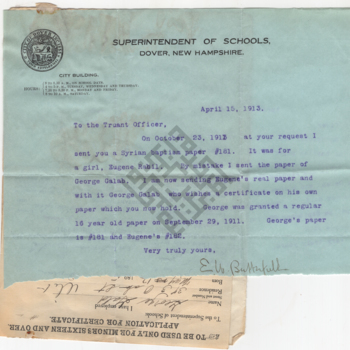 A letter, written by Mary E. Leary, Principal at the Amesbury Street School, on September 9, 1920. It certifies that Najeeb [likely James] Kalil was born on September 20, 1904 and enrolled in school on September 11, 1911. An Arabic letter handwritten by Father Khouri Khalil on March 21, 1911. It confirms the birthdate of Marie Ayoub al Hajjar on October 15, 1894, and baptism on November 30, 1894. A writing sample for Emily Hatem, proving her ability to read and write from dictation. Signed by Gertrude L. O'Connell on March 20, 1911. A letter in Arabic handwritten by Father Khouri Boutrus Rabil on August 14, 1911. Confirm the baptism of Ojaneh (Eugene) Rabil, the daughter of Maron Youssef Rabil on September 12, 1895. Attached to the material related to George Gald.